Bill Tapella, partner at Tapella & Eberspacher LLC law firm, delivered a lecture this spring to students at the University of Illinois Law School. Giving lectures offers students a chance to learn from a practicing attorney. For Tapella, teaching the lecture gives him the opportunity to examine and evaluate his and the firm’s practices. The class was comprised of roughly 30 second- and third-year law students, and the subject matter covered how and why an attorney would want to depose a witness. Anyone who has any information about a legal case can be deposed, and Tapella taught the students in the class how to prepare for the deposition and effectively question the witness. He also discussed the significance of witness depositions and offered real-life examples of questions and testimony for depositions in actual cases. The real-life examples were taken from Tapella’s own publicly accessible case results. Tapella taught the class at the request of Professor James Kerns, an adjunct professor at the University who teaches pre-trial litigation. Tapella also says that he hopes the lectures are beneficial to the students since they are provided with real-life examples of what working as an attorney is actually like. 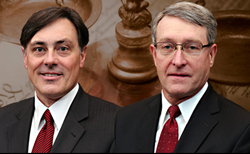 Tapella & Eberspacher is based in Illinois and handles cases throughout Illinois and Missouri. Their lawyers have experience in a wide range of cases, including personal injury, nursing home negligence, car accidents, medical malpractice, business law and more. They offer free evaluations to help potential clients determine whether or not they have a legitimate case worth pursuing. To learn more about their experienced legal team, visit http://foryourjustice.com or Contact Us.